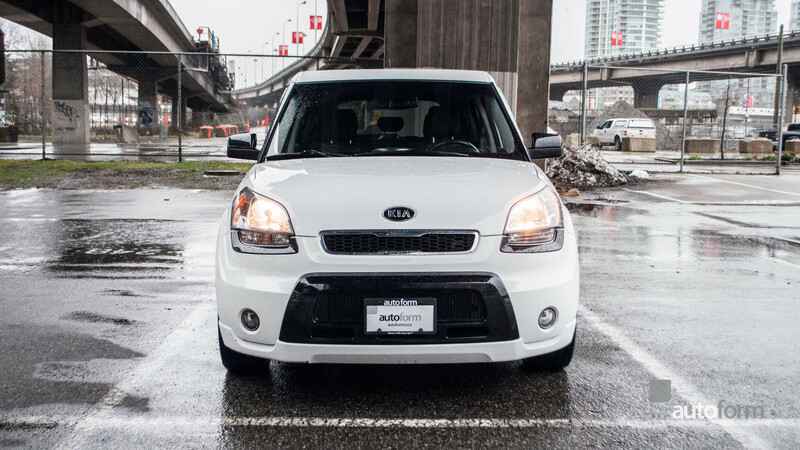 Arguably one of the most well known hip hop songs in history, Rob Base and DJ E-Z Rock preceeded the Kia Soul’s debut by some 20+ years with the release of their hit “It Takes Two,” yet you can’t help to think the engineers at Kia had it blasting on repeat when they designed the Soul. The Soul isn’t just about rocking out on the Satellite radio equipped premium sound system that not only plays MP3 CD’s (got any lying around?) but allows a plethora of inputs: iPod, USB, or stereo mini-jack, but you get to do so in complete comfort. Due to its boxy shape (somewhat reminiscent of a Mercedes G-Wagen) back seat passengers enjoy as much headroom as those lucky enough to be sitting in the good seats, up front. And it doesn’t stop at room and a great stereo: creature comforts abound: power windows, air conditioning, remote entry integrated into the key (a big deal in 2011), a power glass moonroof, and “SOUL” insignias embroidered into the seats, just in case you forget what kind of vehicle you’re riding in. On the road, the Kia isn’t exactly fast, it is however, surefooted, handles reasonably well, and delivers a fun driving experience, given its approachable price point. Don’t expect to win any races, but you will have a lot of fun on the journey, no matter we you’re headed: the corner store, or cross country. The 2.0L 4 cylinder DOHC engine powering this Sport Edition of the Soul produces 142HP that drive the front wheels. Fuel economy is pretty great for a vehicle that’s this versatile and can carry this many people comfortably. Expect to get about 500 kms to a tank of fuel, that tank being only 48L in size, or slightly less than $60 to fill. Not bad. All in all a pretty great little vehicle that’ll make you wanna rock right now.